Mark Cuban complains about everything all the time, which makes him a lovable rogue among boring owners sometimes, and also makes him pretty damn insufferable other times. Last night, when his Mavericks were losing to the Warriors, he did what you or I might do: fire off some tweets. However, unlike you or I (unless you are an owner, which, hi, please trade your guys to the Kings! 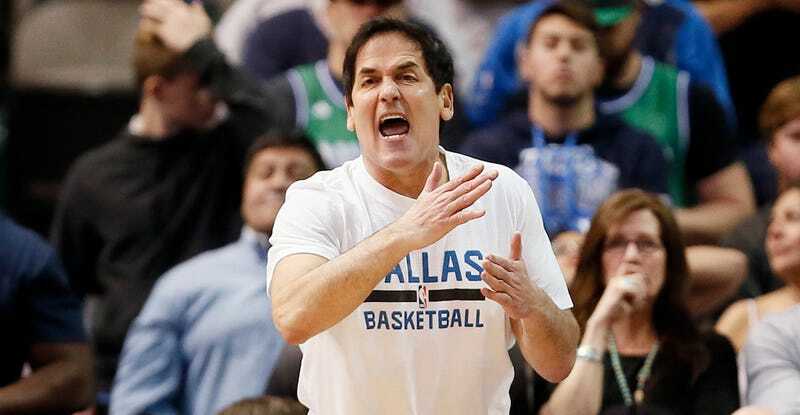 ), Mark Cuban is an NBA owner. Man, Cuban loves to do tweets, some of which are good tweets (unlike this one that he RT’d this afternoon, which is bad). I’d be surprised if the NBA doesn’t find themselves $100,000 or so richer, because in-game criticism via Twitter is a new one, even for Cuban, and they’ve fined him heavily for criticizing officials via less permanent mediums in the past. Good news is, he matches all of his own fines in donations to charitable organizations around Dallas. This is the first good thing that has happened because of Twitter.